It’s easy to browse Pinterest and get serious #HomeEnvy. After all, most of the images have been carefully airbrushed and styled to look almost as realistic as a Victoria’s Secret model after a Photoshop session. Because, let’s be honest—nobody’s home is free of all clutter, perfectly vacuumed, and pet/husband/child-less at all times. But achieving a picture-perfect home isn’t as far off as you may think, either. It doesn’t always take big budget interior designers to create a space that you can love. Here are 6 ways to get professional-quality interior design help … for less. Ask the pros in-store. Shops like Pottery Barn and Ethan Allen have free design services in their store, and Restoration Hardware offers the same service if you use their credit card. You can work with a designer onsite to customize furniture to your specifications, or make an appointment to have the designers visit your home, take measurements, and work with you to design a room-by-room plan that will work with your taste and budget. The appointments and services are free—with the caveat that the designers only use products from their own stores in your plan. Usually, however, the designers can mix-and-match with pieces you already own. Hire a pro … virtually. Design service Havenly offers room-by-room interior design options for as little as $79 per room. Simply fill out a short survey with your preferences, upload photos of your room, and select a qualified interior designer from a wide variety of profiles. A custom design will be put together just for you, and you’ll work with a designer via email and phone to create your perfect room. Similar sites include Homepolish, Laurel & Wolf, and Homee. Hire a pro … in person. 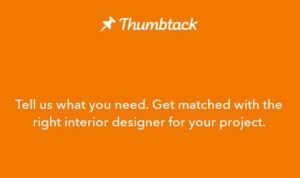 Sites like Thumbtack.com are great marketplaces for freelance designers, many of whom have dozens of reviews where you can get real-life feedback from others who used the same service. Hire someone to complete everything from painting projects to renovations to interior design concepts. Get online. Sites like Pinterest are great for inspiration, but you may also want to try Houzz.com, a marketplace of professional builders, designers, and architects who have uploaded more than 10 million images of homes, rooms and outdoor spaces for your design inspiration. Many photos also feature “shoppable” capability, meaning you can search for an purchase exact items right from the photo. Try a curated marketplace. Many sites specialize now in curating the best of design from around the web and making it easy to purchase great quality home goods at a reasonable price. Most of these sites, which function like flash sale marketplaces, with new designers uploaded each day or week, often feature sales around a specific room or decor style, making it easy to outfit or re-do a space in a single shopping session. Our favorites include One King’s Lane, Joss & Main and Gilt Home. Try an estate sale. Love someone else’s style? Steal it. Well, buy it—at a deep discount. Sites like 1st Dibs and EBTH (Everything But The House) offer upper end goods at auction for prices that are often well below market rates. Have another tip or trick? Leave it in the comments below!